Breathtaking views, a unique combination of forest and lake scenery as well as deep cliffs - all this offers the 68-kilometer jungle trail on Edersee in the district of Waldeck-Frankenberg in northern Hessen. 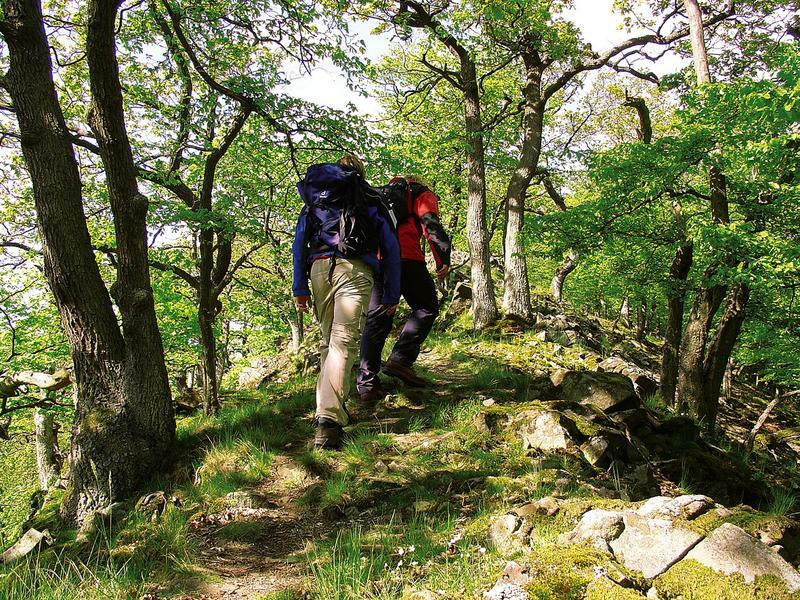 Located in one of the last European primeval forests, the long-distance hiking trail lives up to its name: old, gnarled oak stands and enchanting beech forests bring the hiker into a bygone era. Thanks to their natural beauty, some paths are overgrown with rooting or the hiker sees a bent tree in the middle of the path. But it is precisely these aspects that make up the charm of the long-distance trail and for which he quite rightly bears his name. It is possible to enter the Urwaldsteig at any place, as it is a circular route, but it is recommended to start at Waldeck Castle in the northeast of the route. This is - even at a different starting point - already worth a detour due to its location alone, and along the way reveal the most varied sights and views. A hike away from Waldeck, the hiker finds the crippled forest with its many mosses. A fascinating view of the 12 square kilometer Edersee and the adjacent Kellerwald-Edersee Nature Park can be found in the Kahle Haardt nature reserve. Along narrow paths and past deep valleys, you can also visit a medieval rampart, numerous forests and ancient city walls around the lake. The often unspoilt paths also offer a special kind of experience, and especially in autumn, the colorfully colored forests promise even more impressive views of the Edersee and the surrounding area. In addition to the 68 kilometer long main path of the jungle trail, there are also numerous expansion options and additional shorter circular routes. Thus, hiking with a dog or the whole family on the long-distance hiking trail is no problem. The entire trail can be covered in just under a week. Divided into six stages, each day exciting new sections can be experienced and hiked: whether the Wildpark am Hammerberg, which also has fun for children, the pulpit in the east of the route with its great views of Edersee and Waldeck Castle or the nature reserve Ederufer, which is considered a paradise for waterfowl. Thanks to low altitude differences and many alternative routes or hiking opportunities on the wider cycle path, the Urwaldsteig on Edersee is suitable for occasional hikers, but also professionals and experienced hikers get their money: narrow trails, narrow bridges and steep ravines along the long distance trail leads around Germany's second largest dam. With its natural diversity and the abundance of tree species, the jungle trail is definitely worth a hiking holiday! The certificate Quality Region Wanderbares Deutschland places regions in the premier league of all hiking regions, a carefree package for hikers. This also benefits the region. The experts agree. The needs of hikers have changed fundamentally in recent years. Years ago, a nice way to make a hiker happy, today is the entire infrastructure and the overall experience of a region crucial. In addition to interconnected hiking trails, which should be exciting for families with small children as well as for ambitious athletes, accommodation, information and the connection by bus and train play a crucial role in the question of whether a region like hikers or not, whether Wanderer one Visit the region or not. Heike Brehmer, Chair of the Tourism Committee of the German Bundestag: "Hiking tourism in Germany will only develop so well if the quality is right across the board." This is exactly what the German Wanderverband (DWV) certified quality regions Wanderbares Deutschland offer.